I have to admit to being one of those parents that would love to do more activities with her children but I’m not really sure where to start. I will quite happily attend activity sessions at Roo’s school or held in our local library because they are all set up ready to go. When Miles Kelly sent Roo a copy of their Super Science Experiments I was more than a little bit nervous, I was terrible at science when I was at school! Packed with 40 experiments, Super Science Experiments introduces children to the basics of science in a fun, appealing way. 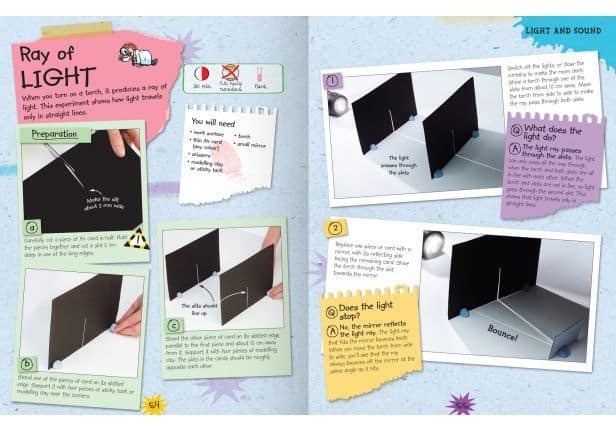 Each experiment is accompanied by an introduction to a scientific concept, clear photographic step-by-step instructions, a list of materials needed, and a Q&A explanation to make children think. Specially designed graphics also indicate the level of difficulty, the time required, and whether adult help is needed. The book is broken down in to four different sections; Electricity, Air and Water, Light and Sound, and Matter and Materials. 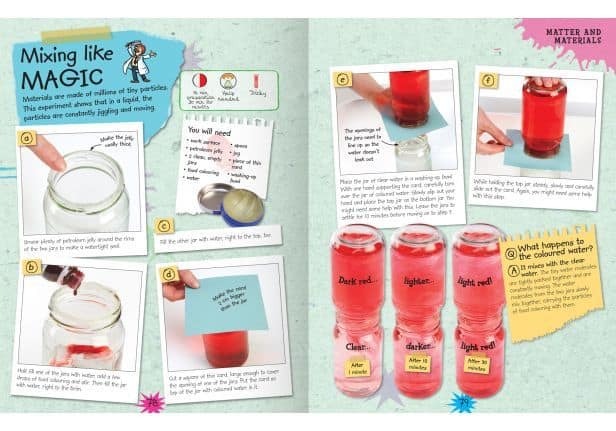 Each sections includes 12 different experiments for your child to complete. The handy guide at the top of each experiment page lets you know how long it will take, whether they they will require any assistance and finally how difficult the experiment is to complete. Many of the experiments use items from around the home, partially the kitchen so you won’t need to stock up on lots of new equipment in order to get stuck in with the experiments. The step-by-step photographs included on each page really do help your little one (or any unscientific adult) understand what they need to do next. At the end, children can test what they’ve learnt with quiz time. Also includes a glossary, further website reading, notes for helpers and a record your results page. Children will have hours of practical fun – and learn something new! Ideal for Key Stage 2. With a RRP of £12.99 personally I think it is worth every penny, especially if you are anything like me and terrible at science. Disclosure: We received a copy of Super Science Experiments FOC for the purpose of review.